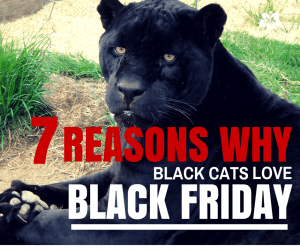 Home » 7 reasons why black cats love Black Friday!! 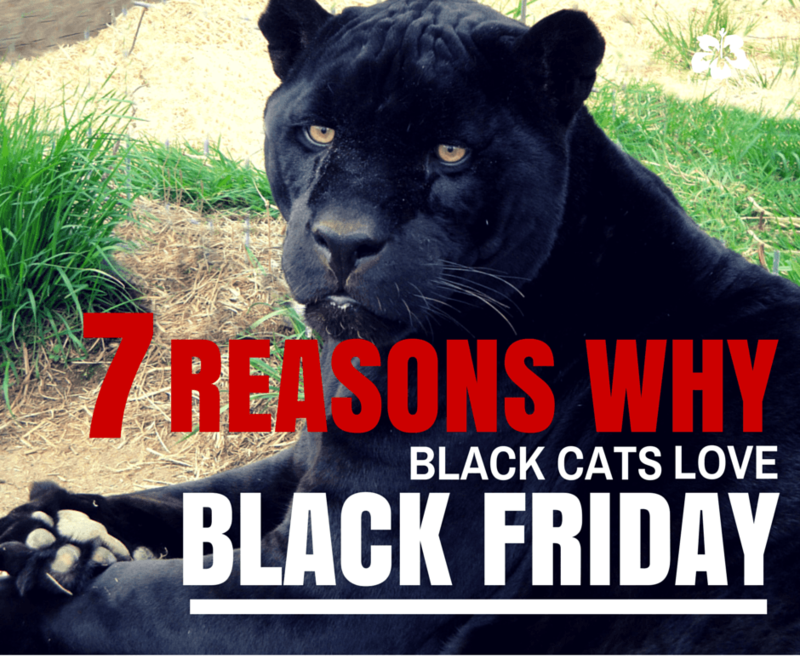 Because these 7 gifts give them the ‘wild at heart’ life they love – what could be better than that!! For $25, we’ll send your chosen recipient a special Wildcat Sanctuary card, noting you’ve made a generous donation to support the wild cats in their honor. This is such a meaningful gift anytime of year for friends, family, co-workers, neighbors – or those hard-to-buy-for people. And isn’t this what the spirit of the season is truly all about, helping those in need? United States Delivery Only. Order soon if you’d like it sent in time for the holidays. Fill out the form HERE. As a Sponsor Parent, we’ll send you or your gift recipient the personal story of the wild cat of your choice along with photos, special greetings and email updates throughout the year. It’s an incredible way to join our rescue team since you’ll be such an important part of their life here at the Sanctuary. Get to know our residents HERE and choose one to sponsor HERE. Our calendar features some amazing shots of all your favorite wild cats here at the Sanctuary. It’s a fabulous gift for yourself, your family, friends and co-workers. And what a wonderful way to help raise awareness, while helping support our rescue mission at the same time. Be sure to check it out and order soon for holiday delivery HERE. You can have your gift recipient’s name engraved on a brick or bench as part of the reflective Memorial Garden in the center of our Sanctuary. Its a unique gift that will last forever. What a touching memorial gift that benefits the cats we all love! You can honor your loved one, 2-legged or 4-legged, this special way HERE. Every cat loves toys! But what about all the tools, equipment, and supplies it takes to build their habitats, perches, platforms, buildings, and dens that make life so much fun, too? Why not make their wishes come true in honor of your gift recipient this holiday season? You’ll find our updated wish lists HERE. And don’t forget to log onto Amazon, whenever you’re shopping, using www.smile.amazon.com and choose WILDCAT SANCTUARY as your charity of choice. When you do, everytime you shop throughout the year, a portion can be donated to the cats – and it’s FREE to do! More details HERE. Feeding big cats is a big job! $120 feeds a big cat, like Tonka, for a month. $80 feeds a leopard or cougar, like Shazam, for a month. $40 feeds a little cat, like Ciega, for a month. Wouldn’t it be a great feeling knowing you’ve given a wild cat a full belly and sweet dreams because of your holiday gift? Donate whatever amount you’d like to help feed a cat HERE. This year, why not give a gift that will never be returned – that will be cherished forever. Knowing you’ve made a better life for a wild cat in need of rescue is one of the best feelings ever! Giving the gift of life is something you can feel such pride in. Your gift will also be featured in our quarterly UPROAR! Magazine, too. Donations of $25 or more will receive UPROAR! Magazine. Donations can be made HERE.